Dead or Alive is a series that has been around for fifteen years, and for its fifteenth anniversary Team Ninja and Tecmo Koei have released Dead or Alive: Dimensions for the Nintendo 3DS. Now the last time we saw a Dead or Alive title was back in 2006 when Dead or Alive 4 was released for the Xbox 360. Well, there were other titles released but these focused more on… let’s just say other interests. Dead or Alive is a 3D fighter that allows players to move towards and away from the screen, with the recent popularity of 2D fighters such as Street Fighter IV etc. and Marvel Vs. Capcom 3, has Dead or Alive: Dimensions arrived on a 3D handheld to bring with it the 3D fighting games we loved? Dead or Alive: Dimensions isn’t the continuation of the series, instead it takes the storyline from the past four Dead or Alive fighting games and has combined the stories into a relatively easy to comprehend gameplay mode titled Chronicle Mode. With the inclusion of all four fighting games, this also means that the title boasts twenty five fighters, including bosses from previous titles. Now Chronicle Mode is where all of the storyline and narrative for the title takes place. The mode itself is five chapters long and players are able to return to each chapter and replay it once again after they have finished it. The story begins with Kasumi leaving her ninja clan to seek revenge against Raidou for crippling her brother Hayate while stealing a powerful fighting technique. Because she left the clan against orders, Ayane is ordered to kill Kasumi for betraying the clan. Kasumi manages to track down Raidou at the Dead or Alive tournament being head by DOATEC which has a hidden agenda for the tournament all their own. From there the storyline focuses heavily on the ninjas but still features practically every character in the series. The plot may be a bit difficult for newcomers to the Dead or Alive universe to understand at first but the game does its best to avert this issue by showing vocabulary hints and backstory about different groups as they are mentioned during cut scenes. The storyline unfortunately does not have a whole lot of depth or character development but fans of the series will appreciate the retelling of all four games at once. If you have been looking for a title that will take full advantage of the 3DS’ capabilities then you won’t have to look farther than the DoA:D. When the 3D is turned off the fights move very quickly at 60 FPS which is very impressive for a handheld title, especially when you consider the amount of detail that you will see on the characters and the environments themselves. The characters are well detailed and will retain nearly all of their looks from past games, meaning you will be hard pressed to find a character that doesn’t look like they did back in the days of Dead or Alive 2 or 3. The stages that you can fight on are numerous and very well detailed with most of the stages featuring different levels of combat. This means that player can still kick their enemies through a glass window onto the floor far below. Extra touches to the levels such as snow effects and fireworks also really make you feel like you’re fighting in a real area. Something that is detrimental to the title though is the fact that there are plenty of jagged edges to be seen. These are not very noticeable during combat but the introduction scenes and victory scenes really show a lack of anti-aliasing and smoothness. Now onto the Chronicles mode cut scenes. It is a bit odd to say the least the way that Dead or Alive: Dimensions uses so many different ways of telling their story. There are a few videos that are played that are CG movies direct from past Dead or Alive titles but do not take advantage of the 3D. On the other hand, there are also full segments of cut scenes that use the character models directly from the game itself. These cut scenes are very impressive to see and are certainly a highlight of the Chronicles Mode. On the other hand though, there is a very high amount of cut scenes that use comic-like cut scenes to tell the story instead. This means that characters will stay still in poses while their dialogue plays, mouth unmoving. These comic-like scenes are rather depressing to see when compared to the rest of the game. Chronicles Mode is fully voiced, which is impressive given the wide arrange of characters that show up throughout the game. The game includes both the English and the Japanese voice work so this allows players to change up what they are hearing. This is useful considering the pre and post-fight dialogue unfortunately has no variety for each character, meaning you’ll often hear the same thing again and again. The sound effects during fights are still as impressive as you will remember it to be. Grabs, strikes, blocks everything is cleanly represented and will help keep you in the action. The background music is just as well integrated as it usually sets the appropriate tone for the stage you will be fighting upon. Dead or Alive: Dimensions is a 3D fighting game that uses the tried and true method of beating an enemy until their health bar is empty and trying to avoid having them do the same thing to you. The main difference with DoA:D from Street Fighter IV on the 3DS however is the way that it handles the control scheme. Given that Dead or Alive only uses one button for kicks and one button for punches the face buttons on the 3DS are easy to use and responsive without having to worry about the shoulder buttons. Dead or Alive: Dimensions returns with the multi-leveled stages as I mentioned earlier. This means you will be able to smash an enemy into a wall or through a wall in some cases, causing heavy damage and sending them flying through, or down the environment. Also returning is the Hold system which allows players to do more than simply block an attack, but reverse it. Dimensions makes use of the touch screen to display all of your current fighter’s moves and combo attacks. These moves are unfortunately thin to touch but they do provide a very simple and easy to learn fight mechanic. New players will be able to make use of the touch screen to initiate any of their fighter’s moves with a touch of the button, or perform complex combo grab attacks with ease. Besides Chronicle Mode, which also works as a handy tutorial that introduces most mechanics of the game through a tutorial walkthrough, there are a number of different gameplay options at your disposal. Of course you have your standard Free Play mode which allows players to pick their fighter, their opponent, their difficulty level and their stage. Arcade Mode is also included in DoA:D but it is a bit different than what you may expect. Players are able to choose their fighter of choice and then choose a course to play through. There are a total of six different courses to unlock and play through, with each one giving you a final time at the end. Rather than Arcade Mode it is more of a Time Attack mode, this means that you won’t be seeing each character’s individual endings because there aren’t any. Survival Mode returns, and similar to Arcade Mode players are given a number of different enemy quotas to meet, unlocking longer fights as they reach smaller quotas. The Survival mode will pit you against 10 and up fighters that will show up immediately after you finish off your previous opponent. The fruit point system does not return for those who remember that from the console versions of the game. The Tag Challenge mode returns in DoA:D but it too only allows players to select pre-chosen opponents through a list of possible matches. Players can select their own two fighters, with special pre and post-match animations if they select partners with backstory (such as Tina and Bass) and enter the fight. While the inactive fighter is tagged out they regain their health meter back. Tag Challenge has seen much more significant change however than the other modes, with players having a certain amount of lives at their disposal and opponents with a very high health bar that deal more damage than usual. This creates a challenging fight that is unfortunately made harder with the fact that you cannot control your tag partner. For some unknown reason, players will be unable to control your partner; instead the AI will take over. Sure you can tag yourself in when prompted too but often you will find yourself losing a match simply because your AI partner is not fighting well and is making your lives dwindle needlessly. DoA:D constantly helps keep players interested by the fact that there is tons of content to be unlocked. Besides new fighters, players can unlock new playable stages, a very large number of costumes for all of the fighting cast and figurines. The costumes will give players plenty of variety of appearances for each fighter and are relatively easy to unlock. Also Tecmo Koei is offering free SpotPass content in the form of extra costumes and other unannounced content sporadically, which means you never know what you may get when you play DoA:D that day. With nearly a thousand different figurines to collect, players will find themselves with the immense task of collecting them all. These figurines are the characters in different poses and can be viewed in the game’s Showcase Mode. In this mode players can select a figurine of their choice and choose whatever stage they want the figurine to be on. Then players can take 3D pictures of the figurine however they wish, with the 3DS’ gyroscope allowing players to change their angle by moving the 3DS around. Don’t even get me started on the number of things players will probably try to do with the various female fighters given Team Ninaja’s love of their female fighters. Volleyball anyone? Unfortunately only one figurine is allowed at a time which means you cannot create a fight scene all of your own. 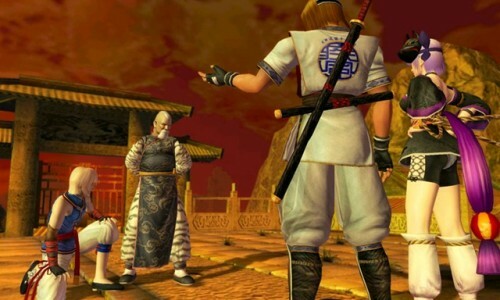 Online Multiplayer is of course supported for Dead or Alive: Dimensions and allows players to face opponents from all around the world in one on one match ups. These matches are kept track of a ranking system that records wins and losses over the player’s lifetime. The online matches are relatively lag free though you may experience some lag with the pre-match taunting. A neat little addition is the fact that the game lets you know if your opponent is using the touch screen by flashing a 3DS touch screen icon in the corner, just in case you were curious how they pulled off that difficult move. StreetPass allows players to gather other players’ ghost data, downloading their fight record as well as their most used character. Eight different ghost data can be kept at once and fought against whenever the player likes, unfortunately once the fight is over, win or lose, it will disappear. The rewards for fighting will be different figurines that can be used in the Showcase mode I mentioned earlier. The 3D effects are rather impressive for Dead or Alive: Dimensions. During cut scenes 3D is definitely something you should have on as they usually do their best to make objects really pop out of the screen and add dimension to what you are viewing. During fights you will gain a real sense of depth to the stage you are fighting on and the pre and post-fight taunts really make great use of the 3D as most characters will take advantage of the 3D and feel like they are coming out of the screen. Unfortunately during combat the frame rate for the battles drops drastically. Dropping to around 30 frames per second the game noticeably feels a bit slower and choppy. This means that you may be adjusting your 3D slider quite often as you switch between 3D for cut scenes and fight celebrations and 2D when you fighting. 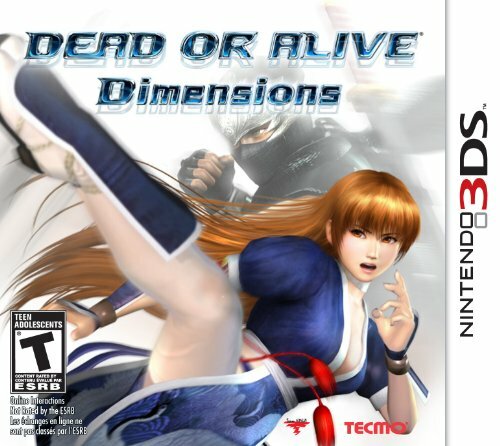 Despite a few flaws in presentation and the awkward changes made to Tag Team mode; Dead or Alive: Dimensions is an amazing addition to the 3DS line-up. Fans of the series will not be disappointed when they pick up the title and anyone looking for a new fighting game will find their money well invested. With fun, fast paced fighting, an impressive cast of characters, extensive unlockable content and a lag free online mode you will find Dead or Alive: Dimensions nearly impossible to put down.